Wondering what that name is? 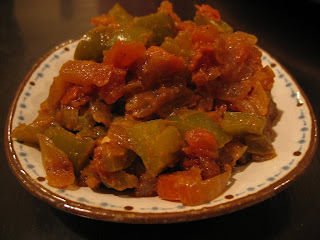 Just capsicum (bell peppers), onion & tomato subzi. My mother makes this and I love having it with chhapathi or with curd (yoghurt) rice. Every once in a while, I make this for myself. It is very easy to make and cooks real quick too. So, all you office-goers can make this in a jiffy!!! Sprinkle jeera & dhanya powders and salt, saute another minute. This dish is very easy to make. It is a mixture of flavors - a little sweet & a little spicy & a little crunchy too. Serve with chhapathi, plain rice or curd (yoghurt) rice. tried this one today .. simple and tasty .. thanks ..